Almost everyone using a laptop these days (Windows/Mac/Linux) has faced issues of heating while doing high-powered tasks. This problem occurs when you are multitasking or are using the laptop in places with a high temperature. This is definitely irritating and may cause a slowdown in the performance of your work or projects. Here we list down the top 10 ways to reduce overheating on your laptop and take it down to a cooler temperature. Inside the case of the laptop are the cooling fans, a feature used to cool down the internals, preventing any overheating that takes place as a result of excessive usage. Sometimes, these fans are stuck or have dust obstructing the proper functioning. You may want to open up the case and check the fans for any obstructions. You can then use a smooth cloth or blunt object to clean the dust-out and get the fans working again. The fans push out air through special air vents, located on the bottom of your laptop. Intake vents are also placed along the side of the laptop. If you are experiencing overheating, you might want to check whether the paths of these air vents isn’t blocked. Also, if there are dust and dirt stuck onto them, you can try blasting them with compressed air to clear the materials. If it’s just a minor obstruction, using a slightly damp cloth will easily clean it off. The BIOS or Basic Input Output System is the UI in your laptop that monitors things like heating and performance of the laptop. If you are experiencing overheating on your laptop, there might be other users with the same issues. This results in software updates by the brand to revise the cooling settings on your laptop’s BIOS. You could check the company’s website to check for updates, but keep in mind that BIOS updates aren’t as easy as updating the operating system. In tropical regions like India, the summers tend to get extremely hot, sometimes even above the 45 degrees Celsius mark. Laptops from international brands are not made to handle this kind of heat, and may tend to overheat when you keep them in such temperatures for a prolonged period of time. Apart from overheating, hot weather can also be quite damaging for your battery and the processor that’s running all the tasks. Prefer using your laptop in a room that is equipped with an air conditioner. It keeps the laptop cool and prevents it from overheating. Whatever it may have been named after, your laptop is made to sit on a flat and even surface, preferably hard. There are certain rubber feet to keep it from touching the surface, helping air get out from the vents. Although, when you do indeed use it on your lap, there is a possibility of the vents getting obstructed due to the angle. To prevent this from happening, prefer using a lap desk. It keeps the air vents away from your legs and helps protect your eggs from excessive heat if you know what I mean. Do yourself a favor, get a lap desk today. The most common reason for overheating is, of course, intense software processes that take up a lot of the processing speed, in turn making the internals heat up faster. If you cannot prevent the heat from getting created, you can try and keep these high-powered tasks at bay. Software used for photo/video editing and viewing should be used for shorter intervals, to allow for the internals to recover from the beating that they have taken. You could even try using some task managers that help clear out the applications that might be sucking battery in the background. Not quite practical but extremely useful, a cooling pad is a semi-mechanical accessory that prevents the laptop from overheating by providing an extra layer of cooling to its internals, albeit externally. A cooling pad is a tricky purchase, especially because options start from Rs. 500 and go up to Rs. 10,000. It all depends on the level of cooling you require to curb the overheating. It connects to your laptop via a vacant USB port and starts cooling whenever you switch on the laptop. If the other hardware is fine, the batteries must be the culprit. With normal wear and tear, laptop batteries tend to fade out after 3-4 years of continuous usage. While they wear out, batteries can start generating a lot of heat that causes the fans to malfunction. Make sure that your batteries are always fresh, otherwise, they might end up damaging even the processor and motherboard on your laptop. Batteries aren’t designed to be stored at full charge, oddly, so if you keep your laptop plugged in at all times when using it you could be damaging your battery. If you have limited tech knowledge or have exhausted all your prowess of the hardware and software, you could contact the laptop brand or even the local electronic store to help you find a solution. 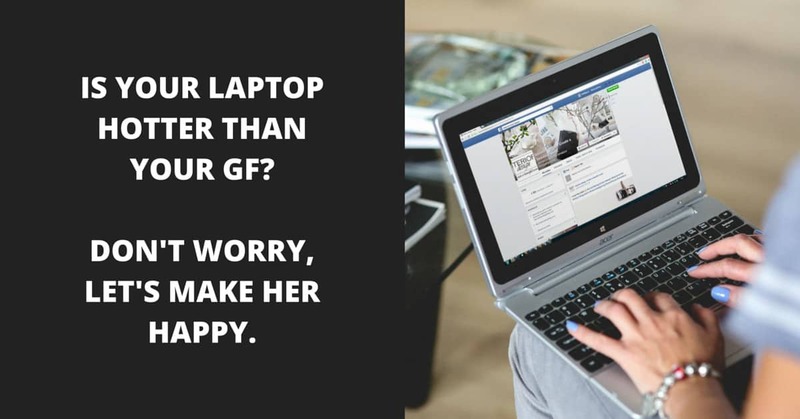 If you are lucky enough that your laptop is covered under warranty, you may want to get a replacement or repair from the manufacturer itself. While it depends on what brand you got it from, laptops generally have a 1-3 year warranty period that covers any abnormal errors in the device. After you have exhausted all the above tips and nothing seems to be working in your favor, the final way out is switching the laptop off. Keep it off for a couple of days and see if things get better. Sometimes, electronic devices need a little hibernation period after which they are good to go, especially when it comes to laptops that use Lithium batteries for power. You could switch off the laptop and go out and meet some friends, have some drinks or watch a few movies. But seriously, go find some tech support. You need that. Simple life hacks and tips like these are probably enough to get you sorted and make your laptop come back to its normal state. Make sure that your laptop is kept in a secured and cool place in order to protect it from any unnecessary wear and tear during the course of usage. For more such tips, check out our website to get insights on frequently faced electronic issues. Why Is Your Smartphone Taking So Long To Charge? A constant learner of gadgets, Ankit has been writing about technology, in general, for the past three years. Currently pursuing a business degree, he also is a freelance writer for GizBot, Deals For Geeks, HT Media, among others. Printer Buying Guide: Things To Know Before You Buy One!